First, I would be remiss if I didn't offer many thanks to the ever lovely Chuck Baudelaire, whose readership has kindly rallied to get me out of a pretty deep funk. This is how I described my situation to Chuck. And told her all I could do was "keep chewing". So, thanks, Chuck and Drunkards. You can (and should) read her blog here. So, the flights from Grand Rapids to Baltimore and Baltimore to Nashville were both highly uneventful. The large Utah Family made their way to the back of the plane and I don't even remember who sat next to me. I read my Real Simple magazine and zoned out. 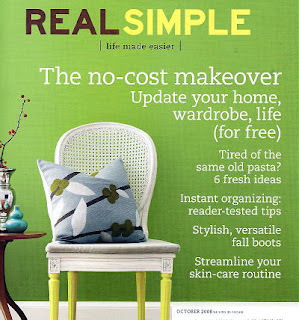 Here's my question about Real Simple. What about the perfect pair of black pants that cost $349.00 is either Real or Simple? I may not be in the right demographic for this magazine. Although, they have some really good recipes. So, I survived my Grand Rapids trip. Next up is Toledo. Sadly, no fun dinner plans with friends on this one. I'm thinking I'll just use my hotel evenings to do some writing. I have an idea that I'm futzing around with. It's a little overwrought, but the process is kind of fun. I'm helping one of my BFFs move into his new house this weekend. I'm stoked for him, even if it means I have to pack his apartment kitchen. He's worth it, barely. The other major thing going on at the moment is the time change. We fell back last week, and in Nashville, that means it starts getting dark at 4PM. It's kind of brutal, but the good news is, if I can gut it out for about six weeks, the days start getting longer again. You feel like a sandwich with a toothpick driven through a green eyeball? Uh...OK.
Real Simple baffles me. I'm pretty sure their demographic is Gwyneth Paltrow. You are worth all the love and support I can muster for you, girl. And if you can survive Toledo, you can survive anything. Take that to the bank. From another Nashvillian...I hope Toledo is at least drier. And it's where Corporal Klinger is from! Several years ago my wife and I went to Cleveland. People kept asking me, "Why would you want to go to Cleveland?" Well, once I looked it turned out there was all kinds of cool stuff to do in Cleveland. The same is probably true of Toledo.